In 2015, the FHA and HUD published a final rule doing away with regulations for an obsolete home loan program known as the Section 235 mortgage. Section 235 mortgages were created in 1968 with the passage of the Housing and Urban Development Act . September 12, 2018 - In 2015, the FHA and HUD published a “final rule” doing away with regulations for an obsolete home loan program known as the Section 235 mortgage. Section 235 mortgages were created in 1968 with the passage of the Housing and Urban Development Act . This allowed the government to “provide subsidies to reduce mortgage interest rates to as low as 1 percent and authorized a new credit assistance homeownership program for lower-income families who were unable to meet the credit requirements generally applicable to FHA mortgage insurance programs” according to the Federal Register official site. “Loans issued with assistance provided under Section 235 that are still outstanding will continue to be governed by the regulations in effect on May 3, 2015” just before the final rule went into effect. In cases where the FHA “has a junior lien that was part of the original Section 235 financing”, the agency agrees to “subordinate the junior lien to the Section 203(b) Mortgage that refinances the Section 235 Mortgage”. 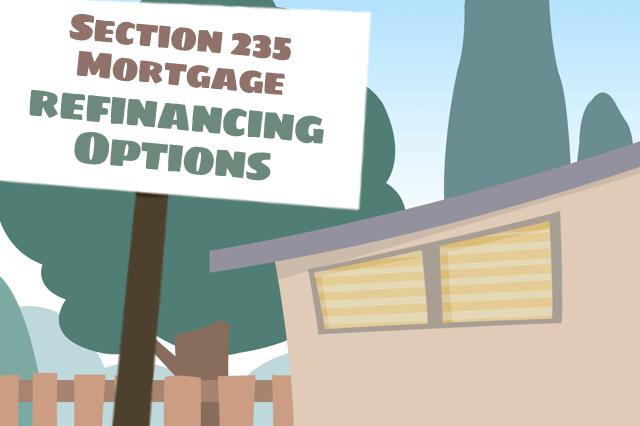 Section 235 Mortgages may no longer be available, but those interested in refinancing into a non-cash out FHA mortgage have options to do so with a Rate-And-Term FHA refinance, a no cash-out FHA refi, or an FHA simple refinance. FHA refinancing options may include 15 and 30-year loan terms, can be adjustable or fixed rate mortgage loans, and may include energy efficient upgrade options under the FHA Energy Efficient Mortgage (FHA EEM) program. Discuss adding funds to your refinance loan with an FHA EEM and what upgrades are FHA-approved.